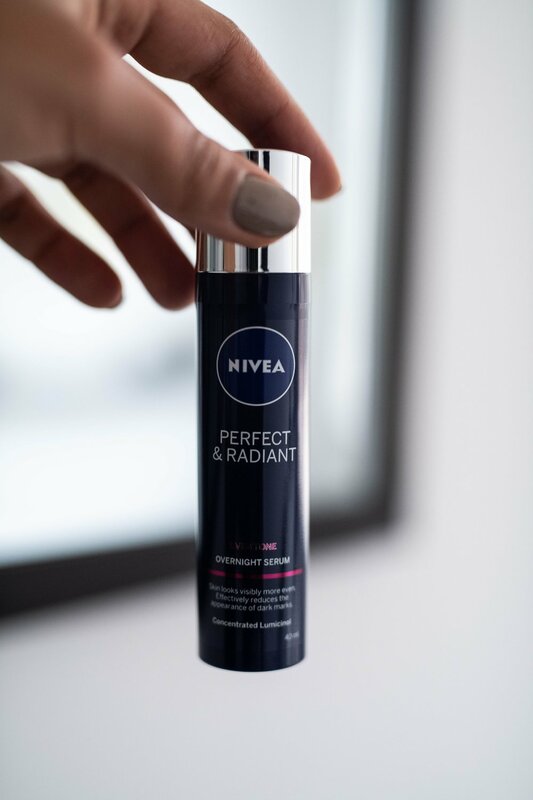 NIVEA Perfect & Radiant has been a highly successful launch for NIVEA, first introduced in SA in 2015. The range was developed specifically for the skin care needs of women with darker skin, African women, and offers a comprehensive range of cleansing and care products which work to reduce dark marks and even out skin tone to reveal a radiant complexion after two weeks of consistent use. The range also includes products for oily skin. The successful NIVEA Perfect & Radiant face care range also introduces a new power duo: NIVEA Perfect & Radiant Overnight Serum, for visibly more even skin and improved cell renewal while you sleep, and NIVEA Perfect & Radiant Extra Protection Day Cream SPF 30. NIVEA Perfect & Radiant offers a cleansing routine for every woman. Whether you prefer to cleanse using water, or without, NIVEA has a quick, easy and effective cleansing solution. I personally prefer to cleanse with water because it gives me a more lasting feeling of clean. Using the NIVEA Perfect & Radiant 3-1 Cleanser gives me the benefits of a cleanser, scrub and a clay mask for those self-care Sundays. The only problem arises when I have to wear make up. Shoot make up is especially heavy in comparison to what I would ordinarily do on myself, so I like to go the extra mile when it comes to cleansing my face. I usually start with a cleansing wipe, to remove the surface layer of make up and dirt from the day. The Perfect & radiant wipes have added eyelash care, so you don’t have to worry about ripping your lashes out or missing any mascara. I give my eyes the once over with Micellar Water just to loosen the last bit of mascara from my lids, and although this would be a sufficient cleansing routine if you prefer not to use water, I prefer to go all the way. Micellar Water is formulated with Vitamin E, the water works like a magnet to lift dirt and make up off the skin. Simple apply to a cotton pad and wipe entire face. No oil film remains after use, and the skin feels soft and smooth. Eyelashes remain beautiful and strong, and the sensitive area around the eye is not irritated; no need to rinse, and skin is left radiant and shine free. Because I have oily to combination skin, I like to finish off my make up removal routine with a gentle wash using the Perfect & Radiant 3-1 Cleanser. The 3-1 is formulated using White Clay, known for it absorbing and smoothing properties, this super ingredient helps control the production of sebum for shine free skin. The fine beads exfoliate and remove dead kin cells to reveal a more even looking complexion. For me, night time is the most important part of any skin care routine, as it gives you time to repair any damage done during the day, or even just boost your skins moisture while you sleep. The Perfect & Radiant range does have a Day Cream and a Night Cream, but since the launch of the Serum, I have preferred to use that. The concentrated powerful serum with Lumicinol and Magnolia Extract diminishes skin tone irregularities and effectively reduces the appearance of dark marks and discoloration, leaving skin visibly more even. Serums feel much lighter and less oily on my skin, so in general I tend to use those; this one especially leaves skin feeling firm and silky. For daytime, be sure to repeat your cleansing routine before applying any creams to your skin. It’s important to start with a fresh face before layering up for the day. The NIVEA Perfect & Radiant Extra Protection Day Cream with SPF30 is enriched with Even Tone Pure Active and SPF30, which works to gradually enhance skin complexion and visibly reduce the appearance of dark marks while protecting your skin from the harmful effects of the sun. Within 4 weeks, skin is left feeling moisturized and looking more even and healthy. Daily finish is matt and smooth, which forms the perfect base for anyone planning to wear make up on a daily basis. Whether you do or don’t wear make up, cleansing is the foundation of any beauty routine, so attention must be paid. The Perfect & Radiant range from NIVEA has helped me reduce the appearance of dark marks, which are really prominent on my fair complexion, without making my already oily skin feel heavy or greasy. I have given a sample to my neighbor and friend Nina who has blemish prone skin that result in discoloration, I will check back in with her in 2 weeks to see how the products worked for her! Real women need real skin care; look perfect and radiant even without makeup.